The announcement follows concerns that excessive social media use can have a negative impact on mental health. 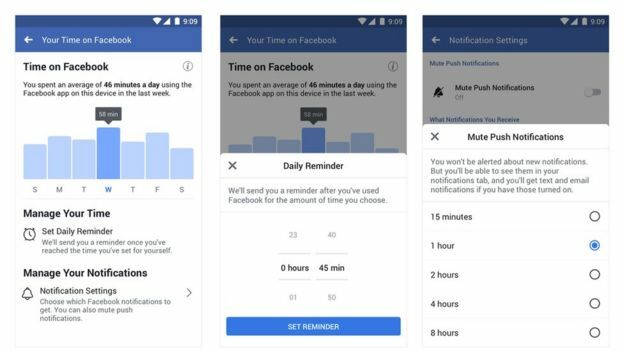 Users will now be able to check how much time they’ve spent scrolling, set a reminder for when they’ve reach their allotted time, and mute notifications for a period of time. But some people say it doesn’t go far enough. “I wouldn’t say it’s a radical change or that it’s going to really change a lot about the way that most people use Facebook or Instagram,” Grant Blank, from the Oxford Internet Institute, tells Newsbeat. Facebook published a blog post in December 2017 that acknowledged the negative effects of spending too much time on the platform. In one experiment, students at the University of Michigan who were randomly assigned to scroll through Facebook for 10 minutes were “in a worse mood” at the end of the day than those assigned to be more active on the site – posting or talking to friends. Another study from UC San Diego and Yale showed people who clicked on four times as many links or liked twice as many posts “reported worse mental health than average”. Lifestyle vlogger and Instagrammer Em Sheldon, 24, tells Newsbeat that checking up on her friends is an “all-day thing”. “While I think it’s part of the job, I do think it’s a problem because we become dependent on our phones and on checking social media. “If I’ve got some free time, I’ll fill that void by scrolling. Asked if the new feature would reduce how much time she spends on Facebook and Instagram, Em said she “doesn’t know if it would help” because “I’m aware that I use social media too much”. But she does agree that having reminder notifications could be useful. “Maybe it would give me the kick I need to put my phone down. Harry Hugo, co-founder of digital marketing company The Goat Agency, says the changes have been a “long time coming”. “With the emergence of mental health issues – especially among young people, who are spending the most time on these platforms – it’s really important that we put things in place that can help limit that. Harry understands the idea of spending a lot of time online, saying he used to use Twitter for 15 or 16 hours a day when he was a teenager – “which sounds unbelievably unhealthy now I look back at it”. Ultimately, he thinks it’s up to people to take responsibility for their own social media use. “We’re the ones that open the phone, we’re the ones that tap on Instagram. We can’t just put it in the hands of Apple or Facebook to fix these problems.